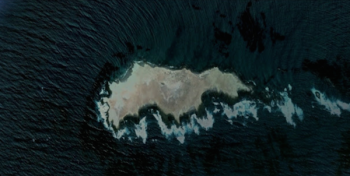 The Isla San Jeronimo is an island in the Pacific Ocean west of the Baja California Peninsula. This is a .75-mile-long island that lies 8.75 SSE of Punta Baja, 5.25 miles WNW of San Antonio, and 2 miles N of the north edge of the infamous Sacramento Reef. This is considered to be one of the smallest islands off the Pacific Coast. This island only has a lighthouse and about 12 different recorded plant species. One of the most significant plants on the island is the Island Bush Mallow. The shores run rampant with many colonies of ground-nesting birds and many pinnipeds. The Sacramento Reef lies relatively nearby offshore. It measures out to about 2.5 miles wide which run NW to SE. The northern edge of this reef starts about 2 miles south of the southern tip of Isla San Geronimo. The southern edge is about 3.2 miles WSW of Cabo San Antonio; the western edge is about 4.5 miles west of the San Antonio. This is one of the top islands to sail to depending on where you are. As of right now, there isn’t a stable community or population on the island itself. If you are looking to expand your horizons through sailing. Make sure to keep the Isla San Jeronimo at the top of your list because this is an absolutely beautiful island with gorgeous views and an even more tranquil and relaxing habitat. This will make you wish that the rest of your days were spent on the high sea looking off towards your next full-fledged adventure!